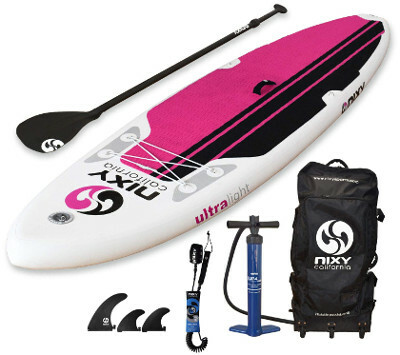 This is not the first time a NIXY’s iSUP finds its way to our website because simply; with every board of theirs there are endless possibilities and adventures ahead of all the people who used them or at least willing to. 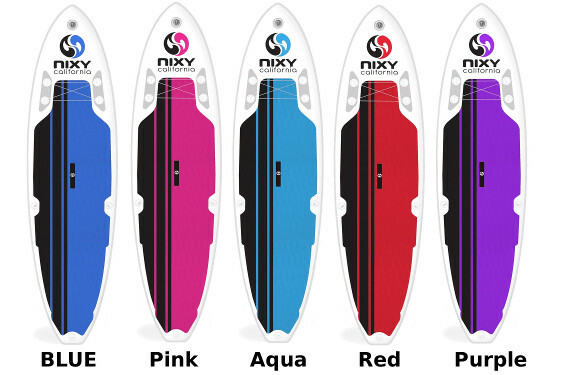 NIXY made themselves a warm spot amongst the greatest inflatable stand up paddle boards’ makers, and that didn’t happen coincidentally; NIXY did a great job making a line of quality and durable iSUPs that are up to the heated industrial competition. You being here, reading this review, means that you already heard of NIXY’s Newport G2 All-Round iSUP which, let me tell you, could be one of your best choices within this category. 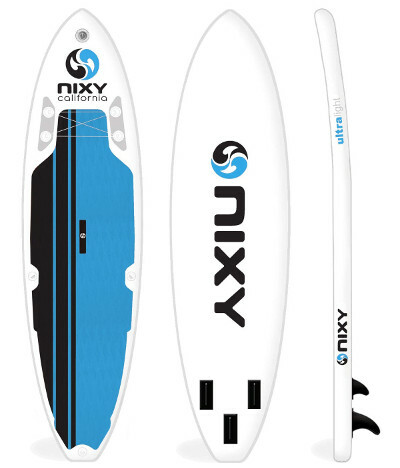 The Newport could be your standard inflatable stand up paddle board with 10 feet and 6 inches in length, 33 inches in width and 6 inches in thickness. One little thing here; standard is by no means regular, simple or usual, on the contrary; NIXY made exceptional iSUPs that are meant to break some records with great packages and extraordinary performance. In case you were a beginner or a yoga enthusiast, you might like to check the NIXY Venice yoga iSUP which is a super stable board (34 inches wide) just like its brother the “Newport”. This latter is thick and wide enough to ensure you a balanced touring experience with lots of space that you’ll use to move comfortably or to bring extra cargo on board. The Newport is one hell of a solid iSUP with a weight capacity that can reach 300 lbs, and it being 6 inches thick completely terminates the possibility of it bend or flex at the center. The NIXY’s family are only meant to float and conquer the water. Advanced Fusion Technology is NIXY’s main focus and as someone who tried and tested their products; this technology does pay off. The Newport is made using layers of liquid PVC material fused with the inner dropstitch core to reach just the perfect bond and solidness to create a strong and firm board. The Newport’s body is entirely reinforced using outer layer bands and airtight and waterproof seals to prevent any leakage. Every part of this board is extremely pressed and laminated with a high end production that you can sense just looking at it; regardless of the numerous layers used to construct the Newport; it all seems like one neat and united piece. All of what’s been mentioned above resulted in an ultra-light iSUP that’s super easy to transport no matter who’s doing it, and yet, once the board is fully inflated, get ready to witness a little industrial miracle where a piece of fabric and layers turns into a full-size, rock-hard board. The colored part of the board is basically the EVA traction pad. This pad is diamond grooved and machine pressed under 200 PSI to make sure it’s perfectly glued to the rest of the board. The best thing about it is that it covers most of the board’s back for better usability. Then we have the front storage area with 4 D-rings and a bungee cord; this is where you’ll get to secure your cargo or any necessary equipment for your touring journey. Next, there are 2 additional D-rings on the board’s sides. These two are meant for kayak seat attachment which is something that goes hand in hand with touring. A 7th D-ring is on the board’s tail so that you can use the featured safety leash. Last but not least, the Newport comes with 3 detachable fins; one of which is central and large (9 inches) and the other 2 are smaller and lateral (6 inches). 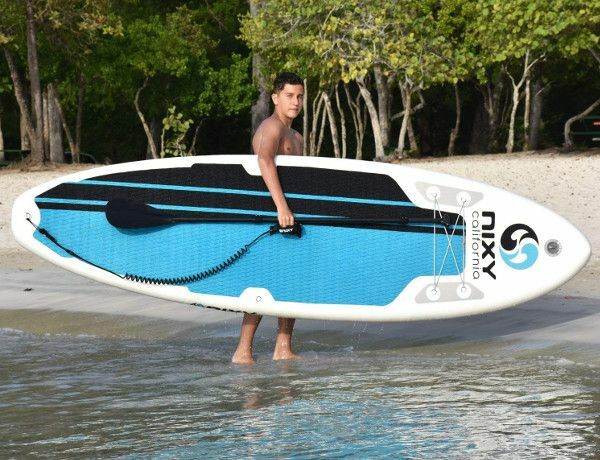 Being light weight, stiff and durable, the NIXY Newport could be the perfect match for all-round water activities. The tracking is great here thanks to the trio-fin navigation system, while the sleek board’s body improves its overall performance making it step out of the slow iSUP’s list. Also, balance is not a problem here; this board is the nearest thing to Yoga iSUPs which, if anything, are known for being super stable. That being said; the Newport can serve different purposes alongside all-round touring. In terms of skill, this board is designed for beginners and first-time paddlers who seek a luxury quality with a touch of professionalism. However, being so practical and functional; the Newport could also be a good choice for about anyone who likes the previously mentioned iSUP; the NIXY Venice. A wheeled NIXY backpack made of heavy duty nylon and PVC. A 3-piece adjustable paddle that goes from 67″ to 82″ with a comfortable T-grip and a fiberglass reinforced nylon blade as it’s also floatable. A Bravo 4D high pressure double action pump. A 10’ NIXY hybrid leash with high quality polyurethane cord and super stretch nylon connectors. One little thing is missing; the repair kit which is something, though might come really handy one day, we hope you never happen to need it. The NIXY Newport is a super tough and durable iSUP. It’s light weight and pressed thanks to the advanced Fusion technology. It’s perfect for all-round touring. It’s a good choice for beginners given its stability performance. It comes in one of the best packages with a strong wheeled backpack. It’s featured with a great EVA traction pad. It can support up to 300 lbs.